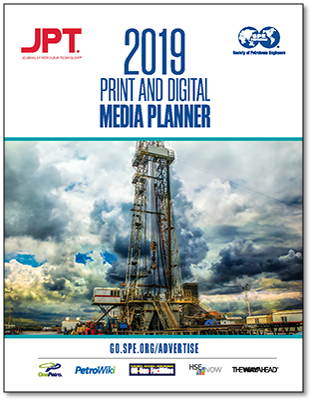 SPE offers a portfolio of numerous websites, online resources, newsletters, and other platforms for delivering your ad message to a targeted audience. WHY UTILIZE SPE'S DIGITAL OFFERINGS? The Journal of Petroleum Technology (JPT) is SPE's flagship online publication, print magazine and weekly newsletter presenting authoritative news about the oil and gas industry as well as SPE and its members. SPE.org is the key portal for all SPE members and industry professionals to access valuable resources. The homepage of SPE’s website is the landing page for the largest individual member organization serving engineers, managers, scientists and other technical professionals worldwide in the upstream oil and gas industry. The SPE homepage displays articles from SPE publications, as well as information on our events, webinars, training, and member services. The variety of options provided on this page are a magnet for high-volume traffic from our qualified memberbase as well as from non members. One Petro is a library of nearly 200,000 technical papers from multiple societies and technical conferences—the place to find solutions to technical challenges. PetroWiki is an open-source platform of background information, how-tos, and potential solutions that cover the full-breadth on industry topics. Oil and Gas Facilities is SPE's online magazine and biweekly newsletter focused on production and facilities engineering, particularly separation, flow assurance, safety, and offshore infrastructure. HSE Now is an online magazine and biweekly newsletter focused on news and technical information affecting the health, safety, security, environment, social responsibility, regulation, and quality aspects of the oil and gas industry. The Way Ahead is an online magazine and monthly newsletter that targets young professionals across the industry covering vital career and education topics. Showcase your company’s technical expertise and thought leadership while generating sales leads by hosting an Expert Hour Webinar.